"Cyborg 009 (サイボーグゼロゼロナイン Saibōgu Zero-Zero-Nain?) is a manga created by Shotaro Ishinomori. It was serialized in many different magazines, including Monthly Shōnen King, Weekly Shōnen Magazine, Shōnen Big Comic, COM, Shōjo Comic, Weekly Shōnen Sunday, Monthly Shōnen Jump and Monthly Comic Nora in Japan. The first two arcs of the manga were published in English by Tokyopop with all the sound effects left out untranslated; as of 2006 it is out of print. However, in 2012, comiXology acquired the digital distribution rights to Shotaro Ishinomori's catalogue." Here's where you can buy the eight episodes of the 2003 anime version: Cyborg 009 - Uncut and Unedited . Vecto justifies killing the SS6 soldiers because of their affiliation with Sable, who Vecto knew resurrected Morphaal. He reviews memory data of the first time he met Gyro on Gyro's home planet, Hodos, when Vecto joined the Magnatronian War 21 years ago in 3005, the same year he was created. Gyro--a Magnatronian whose race conquered Magus, Iados, and Hodos--despised Acaterrian robots and stabbed Vecto in his shielded head after saying they will never bow to the Terrans, but Vecto was not afraid. Over the years, Gyro's hatred for robots didn't apply to him perhaps because Vecto was not an Acaterrian robot but created by a Dinishman, an ally of the Magnatronians during the war. Vecto bumps into someone in the business sector of Acaterra, or New Earth, and Crysilis thinks it's odd that a robot can daydream. They are surrounded by a crowd of people, tall buildings with slanted solar roofs, domes, and wind tunnels. Many of the buildings are linked together with bridges. Crysilis, who sticks out with a blue and black metallic body, tells Vecto he doesn't have to keep his human disguise, but Vecto reminds him that genetic beings and robots are shunned from the planet. Even though there are many Acaterrian robots, they serve humans. Crysilis points out that his emotions make him unique, but Vecto dismisses it as only mimicking. Crysilis says that his programming seems off since Gyro died and suggests that Azmeck take at look at him. Vecto dismisses the offer, but Crysilis reminds Vecto that he's probably on Acaterra's most-wanted list after what happened at the police headquarters and that Vecto has put the team in jeopardy by killing the SS6. Streamline is leaning on a rail curving around the campuslike space between buildings. There are no roads because the hover vehicles drive above them. He realizes that someone stole his Omega Blaster, a prized possession. Vecto and Crysilis search for the thief, and Vecto, while levitating in the air, scans the crowd with his shield (which he sees with) and finds the gun's nozzle sticking out from the trench coat of the guy Vecto bumped into. Vecto patches a comlink to him and Crysilis and describes the thief as a 5-10, Caucasian male around 17 with brown hair and wearing a black trench coat. Streamline runs after the kid, who then puts on a mask with a slit for his eyes. The kid runs into a building and blends in with the crowd. To find him, Streamline shoots in the air with his Turbo Blaster and tells everyone to get down. The thief runs up some stairs but Streamline uses his jet pack to meet him at the balcony and throws him into a handrail. The thief slings a wire from his coat around Streamlines gun and arm which latches to the rail. Although Streamline pulls out his Disrupter pistol with his other hand, he doesn't shoot the fleeing kid. The thief blends in with a crowd on one of the enclosed bridges that connected buildings. He notices New Earth police cars barricading the front entrance but is startled when Crysilis appears behind him and asks for Streamline's gun back. The kid acts like he is returning it but shoots a hole in the glass and flips though it before it automatically seals. He shoots a hook to the nearby building and swings to it. Now on a ledge, he gets dizzy. The police spot him and ask him to surrender. Instead, the kid blasts a window and enters the building as they shoot at him. A police hovercopter shoots a missile at him but the thief throws a device to it which redirects its path back to the hovercopter. With the hovercopter destroyed, he goes up an elevator that stops. He blasts a hole in the roof of the elevator with the stolen Omega Blaster and climbs the shaft with adhering gloves since there were no cables. At the top, he extends a sword from a small black blade, stabs it between the two doors and opens it using side blades that flip out. He is met by Crysilis on the rooftop and tosses a purple smoke bomb at Crysilis that makes a cocoon over his body. Vecto arrives but the thief falls backward off the building and lands on a hover vehicle, then jumps on a transport truck. Vecto transports his Arc Velos XT vehicle, nicknamed "V-Extreme," to the scene and goes after the thief. The silver vehicle is shaped like a halved spade, has a curved glasslike frame that slides forward like a jet's, has a self-sustaining magnetic propulsive engine, has three underbelly spherical wheels, and uses antigravity systems. Vecto is reminded of the time he raced Gyro, who rode a motorcycle, and the time they chased a thief together. The sun is setting as Vecto fires at the thief but strikes the autopiloted, holographic, ad-laden truck he's on. The kid shoots a wire at the V-Extreme and hangs from it. As he climbs it, the vehicle's thrusters melt the wire, and the kid drops the Blaster Omega. Using the sword from earlier, he detached the blade, which was connected to the handle by a small-but-lengthy chain, and strikes it into Vecto's thrusters. After hitting a switch on the handle, the vehicle explodes. The thief lands on a sloped, solar-paneled roof. 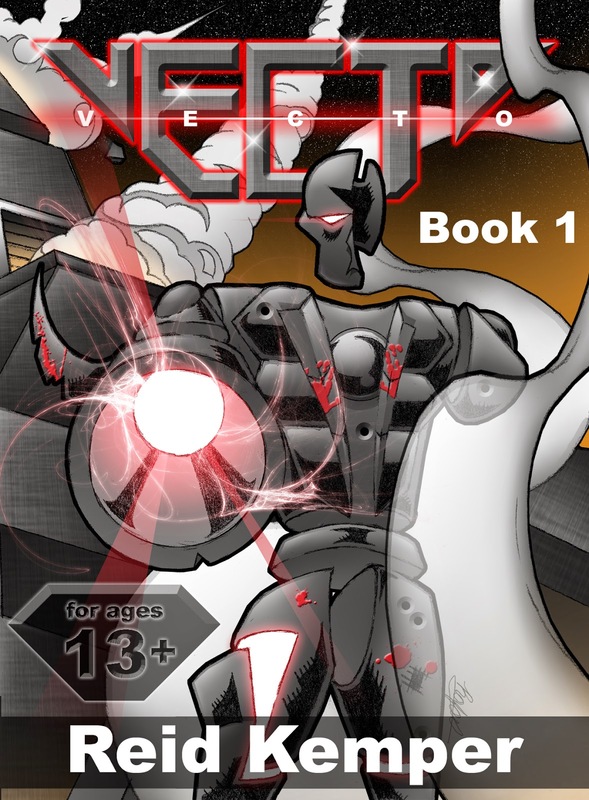 Vecto crashes to the roof and deactivates his human image to reveal floating weaponry. The weapons dropped to the surface to show a floating orb accompanied by a small slab of graphite that was disintegrating in the shield. Vecto transports body pieces to form the shape of an 8-foot-tall humanoid robot with floating parts, then forms a tip from the graphite and points it at the thief's eye. The kid lies about why he needed the gun, and Vecto removes the thief's mask to reveal a well-shaven face, black hair that slicks back, and purple eyes. The kid attacks Vecto with his blade, but it does nothing. Vecto knocks the sword away and pounds the nozzle of his Blaster 3,000 gun in his chest, sending him crashing through the slanted solar panel. Vecto contacts Crysilis and transports three orbs to look for the rifle. Crysilis and Streamline are being chased by police. It turns out that the thief is hanging on a string from the roof and swings back up. He attacks Vecto and takes his Alpha Deta Flint. Vecto warns him that it is a nuclear weapon that would destroy anyone in its radius of 5.25 miles. The thief grabs a chain gun instead, but Vecto strikes a conversation with him. The thief wouldn't give his name so Vecto calls him Chase, which the kid misspells as "Chais" and likes because it sounds like "Chance," one of the greatest fighters on Zendora. Vecto is surprised by the mentioning of Zendora and offers to trade his weapons for the location of the planet. Chais tells him he stowawayed on a ship leaving the planet and can't return but said that a Zarlero master named Leroy Johnson might know where Zendora is. He said that Leroy refused to train him and lives at a farm 30 miles away to the west--past an abandoned factory site. Vecto recognizes the name Leroy Johnson as a traitor, and Chais offers to lead the way to him. Here's where you can buy the Metroid Prime Trilogy, which is better than Metroid: Other M: Metroid Prime Trilogy. Here's where you can buy it: Batman: The Dark Knight Returns (Deluxe Edition) [Blu-ray].